Acuvate Software provides you the best range of cloud computing service, project & meeting workspace, enterprise portal & collaboration services, erp integration, secure business intelligence & big data with effective & timely delivery. Acuvate provides end to end services and solutions for Office 365. Right from migrating your existing mailboxes to setting up your desktops to provisioning SharePoint online for you, it’s all covered. As part of Exchange online services, we specialize in migrating your existing mailboxes to setting up ADFS for single sign on to the cloud. With Lync online, be connected on the go over your PC, phone or tablet with the rest of your organization. We can take care of setting this up for your users. 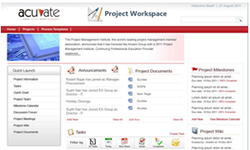 Project & meeting workspace is a SharePoint based Collaboration solution for project teams to collaborate better among themselves. It is relevant for areas such as board meeting tracking, New product launch, Research initiatives, Marketing campaigns and other similar initiatives in an organization. The solution serves as a one stop shop for tracking documents, tasks, people, meetings and other collaterals related to a project or an initiative. Role based access to Initiative repositories. Meeting planner integrated with outlook. Minutes of the meeting generator. Collaborative Tasks integrated with outlook. Lync integration for online Chat. When we develop a solution, we ensure that it belongs to your organization. Branding and usability aspects are kept in mind. We have usability team who take care of all the softer aspects without moving away from the framework that SharePoint offers. This results in a product that you need and aligns with SharePoint’s underlying framework. Standardize SharePoint as a collaboration and content management platform. There are engagement models to handhold your user as well as technical communities throughout your journey. Even if it is small, structure it right. Many knowledge management systems are no more than a glorified shared folders. We take extra care in architecting your information so that it is Scalable, Presentable and Stable. Architecture could also involve integration with other data sources such as Documentum or Network Drives. We always say that SharePoint in not a technical rollout, it is a cultural rollout. Once you have your first implementation with low hanging fruits, Governance and maintenance aspects take control. You need to monitor your Infrastructure, Application, Content and Usage. We provide services in dedicated as well as shared model to support you through this phase. While Majority of business process requirements are handled by ERP or Line of business applications in an organization, there has been a huge gap when it comes to the last mile connectivity of business processes with Business users. This has also been the genesis of business processes that run on “Excel sheet and Emails”. Whether it is about Sales and Operations Planning, Order to Cash, Procure to Pay or any other aspects, you will always find portions of the process running using Excel sheets and emails. Acuvate uses a combination of SharePoint, BPM tools like Nintex, Feature of Excel sheet and ERP Integration to complete the last mile connectivity and bring productivity enhancements. These processes address people aspects related with Hiring, Performance management, Training and development, Work environment and innovation. These process address aspects related with operations and back office such as Finance, Sales & Marketing applications. We have developed solutions to address industry aspects such as Master Data Management, Mould Management and more. Our BI and Data Management Services focus on the end to end lifecycle of data. Whether it is about viewing data in a simple spreadsheet or doing complex what-if analysis, we do it all. Acuvate's Big Data services have been designed to help you build Enterprise applications for analysis of unstructured as well as structured data. We are executing a range of projects on big data including. Social marketing platforms for advertisement targeting. Enterprise Data Analysis Platforms for efficient content and knowledge management. Structured and unstructured data processing for operational efficiency improvements in discrete manufacturing space. Sentiment Analysis to reduce the loyalty decay rate. Acuvate's Mobility services can help build applications for variety of devices and operating systems. Our solutions are device independent and can be integrated with backend ERP/ LOB systems. We can turn your mobile devices into enterprise content delivery platforms delivering reports, documents, workflow participation, alerts and notifications and more. Incentive calculation Engine is a configuration/calculation engine for computing employees' incentives based on their objectives and corresponding achievements. This solution significantly brings down the efforts required to compute the incentives and also increases the accuracy of the calculation. Banking workflows – are a powerful tool to capture, track, improve customer services, optimize workflow at every node and improve the turnaround time for customers. Banking Portal in a box facilitates complex workflows and helps the bank to manage them in a very convenient way. The portal helps banks improvise on the services by tracking and comparing with the SLA's and take strategic or operational decisions. This solution provides a lot of automated services in one box like Account Opening, Letter of Credit, Bank Guarantee, Inward Remittance, Outward Remittance, Home Loan, Service Request, Government Business. It is an intranet solution for an organization, with a host of features that are typically envisioned as a part of any intranet. The solution can be scaled up or down depending upon the needs of an organization. Built on Microsoft SharePoint 2010, it provides a secure collaboration platform and is built to leverage existing IT investment. This solution of pulse gives further return on investment if you combine it with extensions by deploying its reusable workflow components or reusable packaged solutions. Data Quality Services (DQS) - Data quality and impact assessment tool built on top of SQL Server 2012 that helps customers assess the quality of their master data and also impact of the same on transaction data. The tool has preconfigured rules built using data quality services allowing clients to perform quick assessments. It is a solution which can help you review estimates for demand, shortage and supply along with the resulting financial impact. A central location for all your company travel related activities like planning, approval, expense reporting and reimbursement. Standardize your corporate travel process to improve efficiency with greater automation and save costs with the help of SharePoint. Compliance Management is a solution where you can launch multiple type of compliance audits like ISO, CMMI etc. and track the conformance for the same from a single window solution. Multiple types of audit can be configured in the same solution. Facility to create a question master for various audit types. Self-service BI to create own reports. The solution ensures that the right data gets created or updated into ERP (SAP) systems through a proper governance mechanism. Ready-to-use templates for SAP are available to facilitate quick adoption and deployment of the solution. The solutions also ensures a seamless integration with SAP. Validation against country specific database of cities and towns with misspelled names correction. Rich library of validation rules for field names like email id. Applying analytics to almost every business decision and HR is no exception. HR analytics can help you with new ways of approaching HR related questions, from recruitment to utilization to development to retention, attrition and beyond. Make most important decisions relating to your workforce by applying analytics to them. The best and the brightest ideas come from within the organization. How do you enable your employees to contribute to the growth of the organization? Idea Management is a powerful tool to capture ideas and can play a great role in fostering employee involvement. The tool allows moderators to review and comment on ideas. Finally approvers can approve/reject ideas based on the moderator's comments. Get control of your critical power infrastructure and ensure efficiency of power output leading to higher revenues and minimize disruptions with high-performance with in-memory analytics. Opinions and experiences in today’s date are buried and expressed extensively on social networking sites such as Twitter, Facebook, etc. To get a better understanding of sentiments, emotions, moods, and opinions analysis for your organization we bring to you - Sentiment Analysis Solution with the help of Big Data which gives you the power to identify what customers think of your business. The Solution can tell you about all the positive and negative sentiments in the social media about your brand.